Last year Snapdeal' e-commerce platform handled 30 orders per second during the Diwali sale; this year it has handled 300 orders per second in its weekly festive sales. To handle huge traffic, the marketplace player has used a range of forecasting models and analytics tools to predict demand for products and ensure sufficient stocks are available with its sellers when the products goes on sale. It has 1,500 engineers to deal with the huge surge in traffic during sale time. Snapdeal is among the growing breed of ecommerce players in India that are leveraging technology to address sale-time woes. Flipkart, which had to issue an apology last year for jacked-up prices and product unavailability during the Big Billion Day, was able to run the show successfully this year with a few minor glitches on Day 1 of the second edition of the big-ticket event. Ankit Nagori, chief business officer, Flipkart, says, "Compared to last year, the number of customers has more than doubled. There is also a huge increase in our seller numbers. We have ramped up across the board - be it our warehouses, call centres, our delivery mechanism and technology stacks - and this has paid off rich dividends. We have definitely done better than 2014." Unlike last year, the Big Billion Day 2015 was spread over five days and restricted to its mobile app. Organising such large sales events online requires seamless matching of consumer demand patterns with supply-chain logistics. Says Indranil Mukherjee, vice-president & global practice lead for systems, SapinetNitro, "Before going into big-ticket sale event, e-commerce players must use analytics to understand the typical customer journey from evaluation through consideration and purchase - on different channels (website and mobile app) and then accordingly determine demand patterns across categories." Amazon, known to use data analytics and technology to manage massive sales events like Black Friday, Cyber Monday and more recent Prime Day in the US, has been incorporating its global learning in its India operations. Its recently concluded The Great Indian Festive Sale was four times bigger than the last year's Diwali promotion event and two times bigger than the previous big day, The Great Indian Freedom Sale, in August, 2015. "Given our expertise in web services and hosting, we are prepared to handle enormous traffic in a manner that enables a seamless and frictionless shopping experience for millions of customers in a sale event," Samir Kumar, VP, category management, Amazon India. Net-net it is the strength of the technology backbone that decides the fate of the sale event. To accommodate 10X jump in traffic during a sale, one needs to significantly ramp-up the supply chain, technology and forecasting capabilities. The Strategist looks at how the biggies in the e-commerce space are playing the technology card for better experience this festive season. The user interface is the only thing that a consumer sees and interacts with. So if your site freezes during the sale or fails to load, the whole idea of organsing the event is lost. In July this year, Snapdeal refreshed its user interface, across all platforms: the web, WAP and app. "The refreshed interface has been designed to give our products an uncluttered look, to make navigation easier and create more focus on visual elements, especially during a sale. We recorded a 99.99 per cent uptime on the website, WAP and App during our October 13-October 17 Diwali sale," says Rohit Bansal, co-fouder & COO, Snapdeal. In addition to increased infrastructure capability and optimised architecture to handle 20X traffic, ShopClues has introduced a new feature ShopClues Connect to initiate chat between customers and sellers, so that customers can negotiate with sellers directly. "We have also introduced image search solutions so that customers get recommendations based on visual appearance of products. This is very important in fashion and other unstructured categories, especially during a sale. A deal discovery platform for faster discovery of best available deals on a single page, has made navigation faster," says Gyanesh Sharma, AVP, engineering, ShopClues. Effective management of supply-chain logistics is a key to the success of a big sale event. Industry data suggests the number of first-time users placing orders online is quite huge during festive season sales. A poor experience in terms of cancellation of orders, out-of-tock issues, price changes and delay in delivery can seriously dent an e-retailer's image. Snapdeal committed a $300 million investment this year to strengthen its supply chain and logistics. "We have already invested a large portion of this money into our supply chain and logistics, including Gojavas - to enhance our reach. 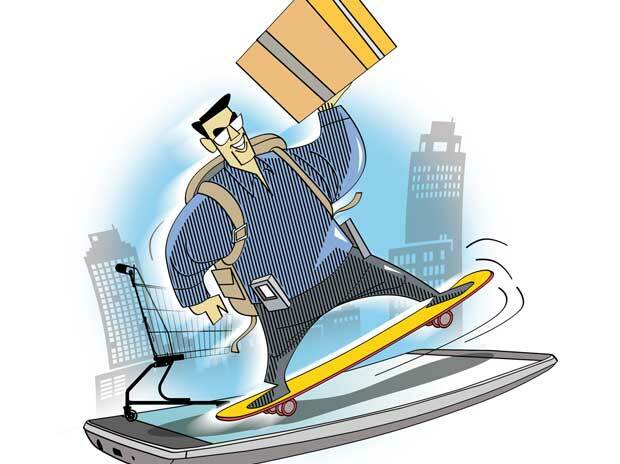 Along with the introduction of services like under four hour delivery for exclusive launches, card on delivery service in over 100 cities and 90 minute returns pick-up across 70 cities, it has resulted in 70 per cent improvement in delivery time over the last six months," says Bansal. Snapdeal now has 1.3 million square feet additional warehouse space across 63 fulfilment centres in 25 cities, close to majority seller and buyer locations. "We rely heavily on analytical tools to plan volumes on different shipment routes according to the load capacity on a real-time basis," says Bansal. Predictive forecasting and analytics enable sellers to forecast demand and plan inventories before a sale to avoid any out of stock situation. "Snapdeal has set up a remote control-and-command centre to facilitate real-time monitoring and spot fixing. We monitor load across centres to identify bottlenecks. We have early warning systems for shipping legs allowing us to plan shipment volumes accordingly," says Bansal adding, this enabled 98.6 per cent on-time deliveries during the October 13-October 17 Diwali sale and 98.9 per cent orders dispatched within 24 hours of order placement. For Flipkart, big data analytics is a tool to understand people's preferences and improve customer engagement. "Through the data collected from the various interactions with our customers on the app, we have been able to offer customers various benefits: personalised category recommendations, fashion taste and preferences and location-based recommendations," says Ankit Nagori, chief business officer, Flipkart. During the recently concluded Big Billion Sale, Flipkart sold more than 8 million units, with a total of 5 million app downloads. "The number of FCs were ramped-up from 13 to 17 this year so that customers from smaller cities could shop with us too. In order to smoothen the backend process, we increased investments in automation technology. We also started implementing the automation technology to pick and move packages to designated pick-up stations, among several other applications which made our warehouse processes quicker and smoother," says Nagori. In terms of supply chain support, Flipkart has built a team of 20,000 delivery boys this year compared with 9,000 last year to ensure efficient delivery. Also to prepare its sellers for the sale, it launched Turbo Charge Campaign aimed at enabling small sellers to streamline the back-end processes involved in handling the massive customer demands during this period. Sellers are now given special packages on inventory and enterprise management to handle peak season sales. As is evident, the big boys of e-commerce are leaving no stone unturned to put in place the best of the technology across all customer touch-points. The latest search technologies (search needs to be simple, fast and contextual), personalisation technologies (to establish past behaviour or just to provide reminders about abandoned shopping carts), cloud based hosting infrastructure that ensures guaranteed uptime and provides scaling on demand, latest navigation techniques etc have all been pressed into service. It is the overall customer experience on the site and on the mobile app during the eventthat will make or break the deal for e-comerce players. Indeed, in an omnichannel retail environment, as competition from brick and mortar stores close in, technology will be the key differentiator.